Marty Langford and I are both comic book geeks and we both have a curiosity for those live-action superhero movies that never received a theatrical release. 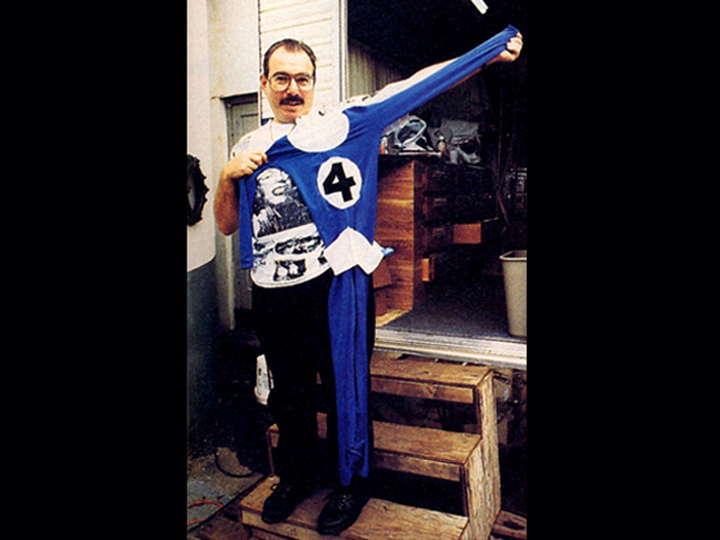 One such movie is the low-budget Roger Corman-produced “Fantastic Four” from 1994, which was never released in theaters and eventually discovered by comic book fans via bootleg at comic conventions in the late 90s. It’s received some ridicule in some circles, yet has a certain charm to it. But what happened? Why was it never released? 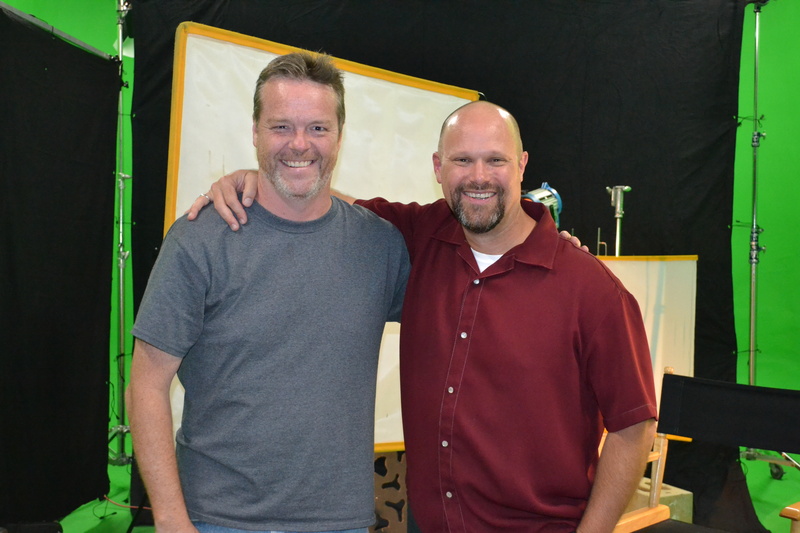 That’s what Langford (pictured above with Jay Underwood, who played Johnny Storm/Human Torch) wanted to know too and along with his friend, executive producer Mark Sikes, he set out to learn more about what happened to the very first and seldom seen “Fantastic Four” movie, by helming “DOOMED: The Untold Story of Roger Corman’s Fantastic Four”, an entertaining and revealing documentary that is surprisingly illuminating. 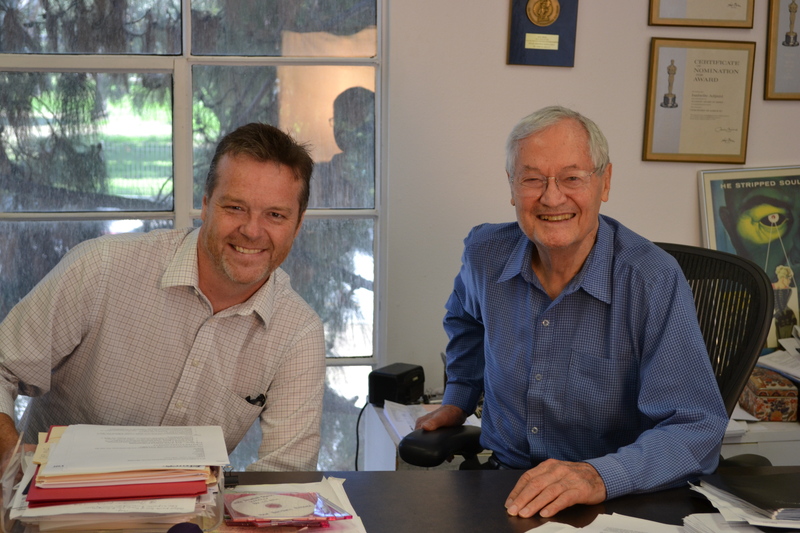 The entire cast appears in Langford’s documentary as well as director Olley Sasaone, Corman (pictured below with Langford) and many others involved in either the making of the film or covering its production. Along with Underwood, the super-powered family was portrayed by Rebeccas Staab (Susan Storm/Invisible Woman), Alex Hyde-White (Reed Richards/Mr. Fantastic), two actors to play Ben Grim/Thing, Carl Ciarfalio (in the Thing suit) and Michael Bailey Smith (as Grimm) as well as Joseph Culp as Victor Von Doom/Dr. Doom) and Kat Green as Alicia Masters, blind artist who wound up the source of dueling affection between Johnny and Ben. Langford is able to find a compelling narrative for “DOOMED” that captures the struggles the movie went through and the reputation it continues to maintain. I had a chance to talk to Langford recently over the phone and we talked about why he chose to make this documentary, why there is such a fan base for this “Fantastic Four” as well as movies about movies that were never released and why the last three “Fantastic Four” didn’t work. Enjoy…. David J. Fowlie: When I first heard about the documentary, I was wondering why a movie would be made about a movie that was made yet never released. So, when did you first learn that an unreleased Roger Corman produced movie even existed? 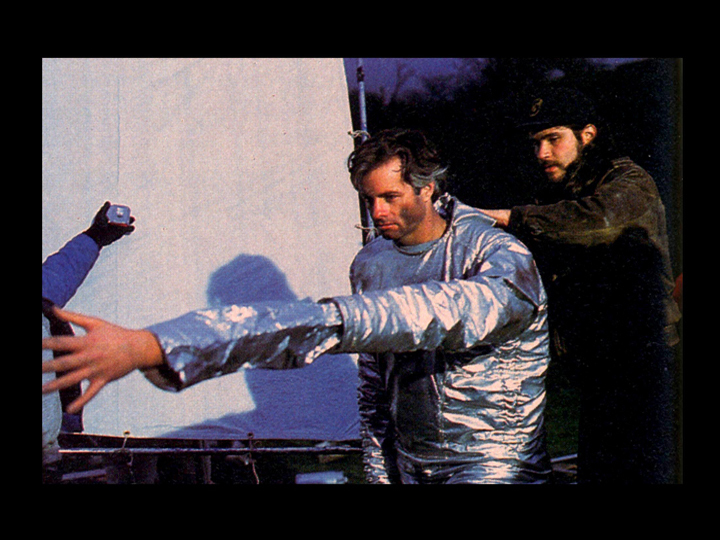 Marty Langford: Well, I guess I’d have to stay that as it was in production is when I realized that there even was one and that was through my relationship with Mark Sikes, who’s the executive producer. He’s a childhood friend and I grew up working for his dad at his dad’s comic book store in Springfield, Mass and he was Roger Corman’s receptionist. ML: Yeah, as well as his casting assistant. So, you know, as soon as Mark had become aware that they were making this movie, he contacted me and made me aware of it. You know, it was before the internet, it was 1992. I probably talked to him once a month or so, but it wasn’t until that Film Threat magazine, Chris Gore’s cover story, that I was really aware that they’d done it. That was kind of the catalyst. I’d always been a superhero fan, a comic book geek – I read comics like you – and I was obsessed with getting every live-action superhero show/movie/short that I could get my hands on and this was a big one. It wasn’t until the late 90s that the copy leaked, you know, that everyone was making their bootleg copies and I think I picked it up at the 1999 Fangoria Convention of Horrors in New York City, when I got my first copy. And that started, you know, probably double-digit copies – always looking for a lower generation/better quality copy. DF: Right. That’s exactly how I came across it for the first time. I was at a comic book convention when I saw it. You know, there’s these bins of either fan-made or unreleased movies – mostly on VHS but some on DVD – that have never been released officially. And I was like – What? What is this? ML: I know! Right next to, like, the Power Pack pilot that never got greenlit (laughs) and horrible student-made Aquaman short or the Doctor Strange TV movie and right next to it was this. DF: So, this is the first movie you’ve directed, what is about this “Fantastic Four” movie that prompted you to, again, direct a movie about a movie that never got released? ML: Yeah, it was, well – I guess I haven’t given this answer before, but maybe I have – it was really because, no one else did it. You know, I was so interested in the story behind it and we all got drips and drabs about what happened, lots of people were on record, but there was just never a comprehensive overview of what went down from the perspective of the people who were involved. I kept waiting for a book, waiting for a documentary. And it got to the point where, you know, if nobody made it in twenty years, it probably wasn’t gonna come out. And my interest was such that, well, if there not gonna do it, I am. And I had access to Mark, which was invaluable. DF: Right, so through Mark, you got access to the actors, the director – were they surprised that you had an interest in this? ML: Yeah, well, they all kinda were. There was all this, you know, when we finally gotten around to interviewing them, there was this, you know, when we finally got into interview them all, they were wondering “why you wanna know this?” (laughs) And I just love the intrigue and I love the mystery and I wanted to kind of unravel, you know, the narrative thesis kind of going through, which is: who knew what and when? I really was interested in how involved the parties were. If they were complicit or if there was active deception or if it was just business. The interest was kind of just all three, to be honest. It depended on who we were taking to – if it was Corman, it was all business. If it’s Constantine, there was some duplicity. If it’s Marvel or 20th Century Fox, they were just doing their dammedest to stop it because they still had an interest in the property and they didn’t want it sullied, you know, by this cheap little thing, this little red-haired orphaned stepchild. DF: You know, watching your movie, I knew some of the rights issues and legal red tape that surrounded the movie. But I was actually kind of surprised – and I don’t know if this was totally your intention – but I was surprised to be enlightened to the perspective of the actors at the time. When you’re making a movie, you expect it to get released. So, regardless of how low-budget or cheesy a movie may look, there’s still the human element, there’s still people involved and they hope it goes well. Is that something that also kind of surprised you as you were making the film, this human side of the movie? ML: Well, that was exactly it. I was hoping to reach them on that level, but it wasn’t until I started talking with them that I recognized just how deeply they felt about it – especially Alex Hyde-White, who was so invested in this role as Reed Richards, which could’ve been a potential game-changer for him. Jay Underwood too, who was probably the most popular actor of the cast at the time – I know he got paid the most and had the most credits. They all saw it – Oley, saw it as this opportunity to show the world they could do with a superhero property. It was going to be released theatrically, at least that’s what they were told and understood. It would be the first of the franchise, which they had hoped for. They started to do the convention circuit with only a trailer and making appearances, seeing the fans. And when they understood that the fan base surrounded this, it wasn’t that they saw dollar signs, although the probably did, it was that they saw – you know, rarely do all actors get a chance to interact with and see the people who they’re performing for. And these guys were just overwhelmed with the support they were receiving in the fan community. DF: Especially the fact that none of these fans had even seen the movie! ML: Yeah, I know! Right! Exactly. It was just like me, they had these saucers for eyes, imagining what it was gonna be like to see Mr. Fantastic stretch and Ben Grimm change into the Thing, you know? The expectations, you know, we all had them, especially comic book fans and with movies coming out. Hopes are usually, well I don’t know if they’re usually dashed, but they’re usually tinged with a degree of sadness, once you see it and it’s over. And with this, there was never that. There was always, the expectations kept building and building and building – for me, twenty years, well I guess ten years, less then ten years from when we saw the movie. And then to hear their stories – they were just so happy to tell it, all of them, each and every one of them. DF: One moment during the movie that kind of made me chuckle and kind of made me sad too, was the part where they actors finally got a chance to see the movie and it was a situation where they were asking for a copy from a fan or even had to pay for it at a convention. ML: Yeah, I loved Kat Green’s (who played Alicia Masters) story about being in a party and a guy coming up to her and saying, “Hey, you’re Alicia!” and Carl (Ciarfalio, who played Thing) who had to literally buy a copy off a vendor. He clearly told that story before with the way he delivered it. Yeah, cuz they never did. It was Oley and Glenn (Garland, the movie’s editor) were holed up in the edit and these guys never saw it cut and it wasnt until much later when they did. DF: You know, this is one of these documentaries, and I doubt you planned it that way, but it’s similar to this subgenre of documentaries lately, with John Schnepp’s “The Death of Superman Lives: What Happened” and Frank Pavich’s “Jodorowsky’s Dune”, they both focus on movies that either never got made or were totally scrapped. In this case, here’s a movie that did get made. So, what did you think the fascination is and curiosity that draws viewers to movies about movies that were never released? ML: I think part of it -that’s a great question and I’m only now coming up with an answer. I think comic book fans have had our genre and our love kind of taken away from us, in a way. We were always kind of niche-y, we were always in our own little world, our group, our sub-culture of comic book fans. And once these movies started making into the mainstream, something was taken from us. It was no longer just ours, it was everybody’s. So, with these movies, “The Death of Superman Lives” and George Miller’s “Justice League” movie and, to some effect, “Jodorowsky’s Dune” and “Fantastic Four”, this is still something that we can claim as our own. You know? So, there is an interest in all of these, but it’s our interest, it’s our little world. Most people aren’t interested in what happened to “Superman Lives” or “Fantastic Four”, hopefully I can get the general public to recognize that it’s an interesting enough narrative, a story with conflict – good guys/bad guys – and it will cross over. But yeah, these guys are hungry and they want more, these fans, you know? I guess John Schnepp is developing a TV show, where he’s going to be doing more of the “Superman Lives” documentaries that he did on other properties. I know he’s doing the “Justice League: Mortal” and I think he’s doing the J.J. Abrams and McG Superman movies that had been developed and disappeared. DF: That’s very interesting. There’s so many cable channels now or even online outlets that would pick up something like that. I can see, like you said, with the fan base, I can see audiences kind of clamoring for something like that. ML: Yeah, I mean, I guess you’d run out eventually (both laugh), but in our case, with “Fantastic Four”, it’s a unique type of thing. Although arguably Marvel and Fox would do it again with “The Amazing Spider-Man”, there was a rights issue on that. I think it was the second one, which they really raced to get out. But that movie came out and got a mainstream release. DF: Sure, because it was Spider-Man. DF: So, this movie has been kind of working the festival circuit, right? DF: And it’s getting a digital release on October 11th. Here’s the thing though. 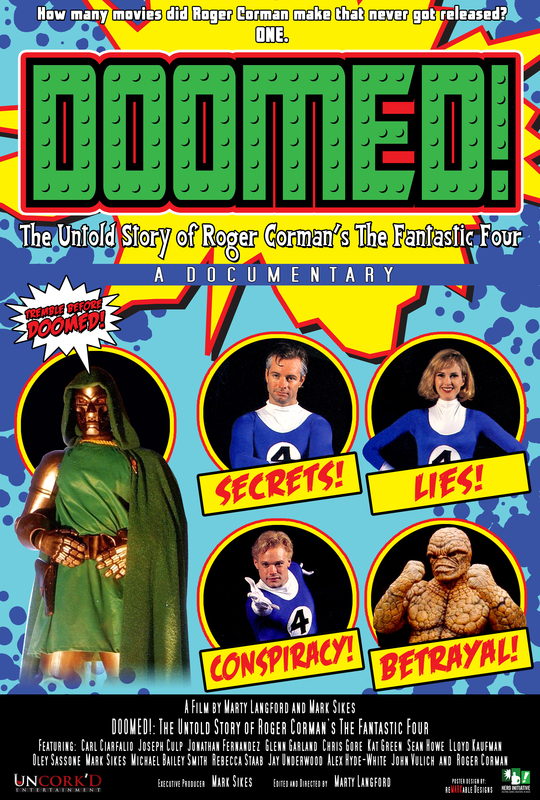 I’m watching this movie and I’m thinking, how great would it be for this documentary to be released on DVD/Blu-ray with the Corman-produced “Fantastic Four”? ML: It would be. We’re coming out on physical media on December 20th, but “Oh my God” – that wasn’t the hope going into this, but as we’ve been getting pretty good press and moving along to our PR guys and recognizing the interest in it, I just have to believe that Constantin and Marvel – I mean they obviously know about it – but, why not, you know? Avi Arad didn’t destroy the negatives. It’s there. It’s somewhere out there. With a little investment, oh it would be – we started a hashtag, you know, #releaseCormanFF – but honestly, that would be the ultimate form of validation. DF: Because, come on, how many people have come up to you after seeing this doc, asking how they can see this “Fantastic Four” movie? ML: Well, yes. Everybody has. The answer is, go to YouTube (laughs). It’s out there. It’s everywhere, if you want to see it. The question should be, “How do I see this movie as it was meant to be seen?” You know, they didn’t go through full color correction and effects work. The version that leaked out was incomplete. They had music. They had done a mix on it, but they never color corrected it. They only thing that ever got graded was the trailer. There’s a YouTube link that has a beautiful transfer of the trailer and it’s gorgeous. The movie looks amazing for what it was. You know, it’s not gonna get past the stitching in the costumes and the lame effects, the cheesiness of it all will be there, but that’s part of its charm. I don’t want that to go away. I just want to see it like those guys did back then. DF: Right. Well, I got one final question for you and the answer is going to be totally your perspective. What do you think of the three “Fantastic Four” movies that have been released by Fox and why is it that they just can’t seem to get it right? ML: Again, a good question. I’ve seen all three of them, of course. I didn’t hate the last one, frankly. I think I saw a good movie in there somewhere, but I think that there was interference. I think that was a nightmare. I think the element that Corman’s movie had that attracted me to it and that makes it stand the test of time and that was missing in the other movies was a sense of family. The Fantastic Four are a family. They’re the first family of Marvel Comics and Corman’s movie really got that. It understood Johnny and Sue’s sibling rivalry and relationship and understood Reed as the big brother and Ben as the big uncle. They’re a family unit and this movie gets that, whereas the other movies don’t deal with that. They’re just four people with different powers that fight a big baddie. That whole family element is missing, which I think is what the Fantastic Four is all about and unless you acknowledge that, I don’t think they’re ever going to succeed. I think Marvel gets it. I hope eventually they’ll get it back from Constantin, who has the rights – that’s the great kind of tragedy here – is that, Constantin’s play twenty years ago worked. They pulled it off. They retain the rights and till this day, still have them. And still, on each of those three movies, you watch the opening credits and it’s a Constantin film production. They made hundreds of millions of dollars off this crappy little million-dollar movie. DF: That’s crazy. Well, at least we have “The Incredibles” and Brad Bird’s sequel. ML: Aw, dude. I know. I can’t wait for that. It’s one of my most anticipated movies – yeah, that did it. Brad Bird gets it. DF: Yes, he does. Hey, Marty, it has been great to talk with you today. I feel like I could go on and on talking to you. Let’s keep in touch, though. ML: Yeah, please do. Alright, thank you.